For a man who got up in time to be at the corner of Broadway and Maxwell in Lexington at 4:00 AM, Chef Jacob Graves looked plenty fresh and happy at 2:00 PM on Tuesday, and that made me happy, too. His presence at the Tuesday and Thursday editions of the Lexington Farmers Market is such good news for those of us who like to eat fantastic food, like to know the source of that food, and like that source to be as local as possible. After cooking only for the Saturday editions of the Lexington Farmers Market in 2009 -- his first season -- Chef Jacob now produces his outdoor "pop-up restaurant," with its substantial kitchen set-up, at least three days a week, and sometimes adds the Sunday Market on Southland Drive as well. Both the Broadway/Maxwell and Pavilion locations have some outdoor picnic tables near Cookin' Up Kentucky's tent. You can order and then watch --- and smell -- as Chef Graves cooks your food. I know of no other restaurant where the distance and time are shorter from the farm to your plate. And what a plate! This man knows how to cook, and how to use the fine commonwealth of traditional Kentucky foods in new ways. The popularity of the green tomato/bacon/aioli sandwich suggest how much we love Chef Jacob's inventive ways with our familiar ingredients. Aioli on a BLT? Lime cilantro cream with our grilled pork loin? Turnip greens in our morning omelette? Turnip greens?? And he does sweet as beautifully as savory. The proof is in the (homemade) custard-filled crepes with local fruits often available on Saturday mornings. In addition to Chef Jacob's cooking smarts, it takes a rather dramatic investment of time and brawn to bring this beautifully cooked farm-fresh food to us. I wanted to know specifics, so I asked Chef Jacob what is involved in "building" his kitchen and buying ingredients each Market day. He says he gets to the Market at 4:00 AM because it takes him at least a couple of hours to get his equipment set up. By around 6:00 AM the farmers are beginning to roll in to set up their own stands in advance of the 7:00 AM opening time. Chef Jacob buys his ingredients from the farmers who grow what they sell at the Market. That way he knows exactly who grew the Kentucky vegetables, meats, dairy, and eggs that end up on Cookin' Up Kentucky's plates soon after. Just as the farmers intend to be ready for customers at 7:00 AM, Cookin' Up Kentucky intends to be ready to cook our breakfasts at that early hour. Even with the 4:00 AM prep start time, Chef Jacob says being ready to take a customer's order right at the 7:00 AM Market opening start time still eludes him. He continues to work to speed the set-up process, and has polished his procedures enough so he is ready to go by 7:15 or so most days, and improving. 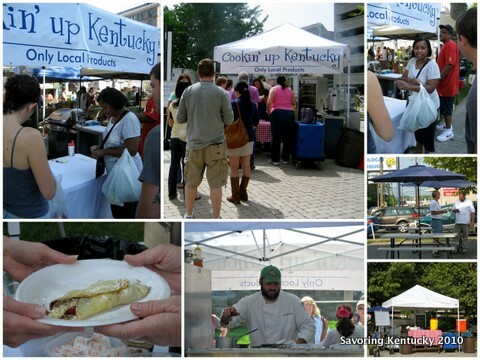 You can "like" and keep up with Cookin' Up Kentucky on Facebook. This is Savory Kentucky Bite number 16 of 116 Savory Bites created in honor of the Alltech FEI World Equestrian Games. We Sleep In. Our Farmers Don't.